By Tomasz Jedynak - PhD. How to use the auto loan payment calculator? If you want to buy a new car and are considering taking a loan, this auto loan calculator will help you estimate the cost of borrowing. Our car loan calculator will also help you work out what will be the best loan deal for you. Moreover, thanks to this car loan payment calculator you will be able to decide whether you can afford to take that particular loan. Note that you can use our tool either as a used car loan calculator or as a brand new car loan calculator, changing between these two by clicking the advanced mode button below the auto loan calculator. What is the formula for calculating payments on a car loan? How does the auto loan calculator work? What are the main pros and cons of taking an auto loan? We will also explain to you step by step how to calculate the monthly payments on any car loan and how to take into account sales tax. If you're considering buying a recreational vehicle, check our RV loan calculator. The auto loan (or car loan) is a type of a short-term personal loan, used for purchasing a car. It works like any other secured loan granted by a financial institution. Once you take a loan, you have to make a repayment each month on the principal and the interest. The main difference between the standard short-term loan and an auto loan is its purpose – in case of an auto loan, it is strictly defined. Another difference is that car loans have a built-in collateral - the purchased car. So, if you are not able to pay the installments and as a consequence are unable pay back the borrowed money, the car is legally repossessed to the lender. Car loans differ from a mortgage because you do not need any real estate collateral to apply for it. Also, the loan granting process is less complicated and shorter in the case of auto loans. Another difference is the payback period length: in the case of mortgages it could be as long as 30 years, the typical term of a car loan is between 12 to 60 months. Well, it is easier than you think. Once you find the car you want to buy, you usually know its price. Basing the calculations on that price you should be able to work out the amount you need to borrow. In the simplest case, it is the price of the car minus the money you have. A car loan allows you to borrow the fixed sum of money you need to buy the vehicle. After the purchase, you have to repay it in fixed monthly payments, usually over one to five years (12 – 60 months). The interest rate is typically constant over the whole lending period and depends on how much you are borrowing. The general rule of a thumb says that the smaller amount you borrow, the higher the interest rate is. When considering taking a car loan for buying a new car, it is worth knowing that there are two main types of financing on a car loan: direct lending or dealership financing. Direct lending has a form of typical loan taken from a bank or credit union. You sign a purchase contract with a car dealer and then use the money borrowed from the direct lender to make the appropriate payments. In dealership financing, it is a car dealer who initiates the process of taking a loan and do all necessary paperwork. In dealership financing you usually cannot choose the lending institution – usually the loan is granted by so-called captive lenders who are associated with a car manufacturer. Note that to promote sales, car manufacturers offer attractive financing opportunities via dealers. Usually, it is more profitable to by a new car with dealership financing, as it is significantly cheaper – interest rates in such loans can be as low as 0.5%, 1% or 1.5%. The interest rate is given for a yearly period. sales tax - sales tax rate. Now we know the formula used in the car loan payment, we can try to perform a sample calculation. Firstly, let's assume that you want to buy a five-year-old Jeep Wrangler which is worth $20,000. You also have a car – an old Chevrolet Silverado, worth about $7,000, and $1,500 on your saving account. The sales tax in your state is 10%, and the interest rate in the car loan is 4%. You want to take a three-year loan. The answer is $360.19. It is your monthly payment in the loan from our example. You can also forget about all these long hours of counting and use our smart auto financing calculator to obtain all these values. In the simple mode, the value in the field loan amount is filled automatically – it is the same as the value in the field price of the car. If you choose the advanced mode, you can provide additional information that helps you to determine the amount of money you need to borrow. These are: money you have, trade in value and sales tax. We have already explained their meaning in the section car loan payment formula. In the next step, choose the payback period (loan term). It could be expressed in years and months, however it is usually a multiple of a year. And that is it! The result of the calculation will appear immediately in the field monthly payment. This is the amount you will have to pay every month to repay your debt. 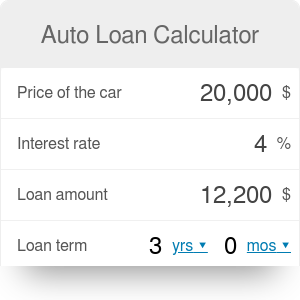 The amount in the field total interest paid on the bottom of the auto loan calculator shows the total cost of your loan within the whole period. Do you think that the estimated monthly installments are too high? Or maybe, you believe you can afford to pay higher installments? Try to change some values in our calculator. For example, lengthening the loan term will result in lower monthly payments. Similarly, a lower interest rate leads to the lower installments. However, you need to remember that the interest rate depends mainly on the lender's offer. Taking a car loan is not the only option when you are buying a new car. Probably the best solution is to buy a car outright with cash. First of all, it allows you to avoid the monthly payments which may be the serious burden for your budget. Moreover, paying with cash means that you do not have to pay interest, which reflects the price of borrowing, not the price of a car. Also, an outright purchase gives you full flexibility as you can do whatever you want with the car. And last but not least, when you are buying with cash, you avoid the risk of the underwater loan – the situation in which due to the depreciation you owe more than the car is worth. Unfortunately, not everybody can afford to buy a car with cash. Sometimes, you have to decide whether to take a car loan or lease a car. Below you will find some pros and cons of taking a car loan. Auto loan is a very simple product. It is easy to arrange and understand. Car loan is flexible – you can choose the payback period from one to five years. Thanks to car loan, you become a legal owner of the car just after the purchase. So, contrary to leasing contracts, you can immediately modify the car exactly how you want. From the seller's perspective you are a cash buyer, so you have a stronger position in price negotiations. If you do not have a good credit score, you will not get a car loan. In the case of car loan, the monthly installments may be higher than in other forms of financing the purchase (e.g. leasing). Contrary to the leasing agreement, you are responsible for the service and all of the repairs of the vehicle. Due to the car depreciation, each year your car will be worth less. When you decide to sell it, it will be considerably cheaper than at the time of purchase. Auto Loan Calculator can be embedded on your website to enrich the content you wrote and make it easier for your visitors to understand your message.